Blenheim Palace is a stately home near Oxford which is famous for being the birth place of former UK prime minister Sir Winston Churchill. It is the family seat of the Duke of Marlborough and the current building dates back to around 1705. The palace stands in grounds which were designed by Lancelot “Capability” Brown, who was one of Britain’s acclaimed garden designers of the time. He created a natural parkland surrounded the house itself including the construction of two lakes. On a tour around the palace you will visit the ornate state rooms including the huge library which has it’s own pipe organ at one end. There is a lot of the palace that you don’t see though. There is a beautiful chapel included in the visit too and of course you get to spend as much time as you’d like in the park and the formal gardens. The whole place is beautiful, but to be honest, we were a little disappointed. We felt we didn’t get very much for our hefty admission fee. Upstairs there is a strange ‘untold story’ visitor experience which we found somewhat tedious. There is a fascinating exhibition about Sir Winston Churchill, but this is crammed into small rooms which were unbearable on our visit as you couldn’t get near any of the exhibits. The upstairs tour costs extra as does a visit to the private apartments, which were closed on our visit anyway. In the parkland there is a little train which for any extra fee takes you to a the Pleasure Gardens. Here there is a huge maze, children’s play area and butterfly house. There are also some nice exhibits of old garden machinery and a miniature village too. In the parkland, you’ll be impressed with the beautiful bridge over the lake and you could take a walk to the Column of Victory. There’s a nice waterfall and you can also see the folly spot where Sir Winston Churchill proposed to his wife Clementine Hozier. Visitors to Blenheim Palace pay at the gate when entering and your ticket can be converted to a 12 month pass if you plan to return. This makes the steep entrance fee of £27 per adult (2018 prices) much more bearable but only if you live close enough to return. Blenheim Palace opens all year round. The park and gardens are open daily from 9am and the palace from 10.30am. 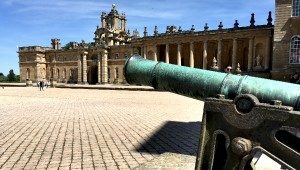 Blenheim Palace is in the attractive village of Woodstock a short car journey from Oxford. The S3 bus service to Woodstock runs every 30 minutes from Oxford train station.